Vitae has developed a range of new resources to support those who manage and mentor researchers as part of their role. If you have responsibility for supporting research staff or students in their professional and career development we think you will find something to interest you. The resources can also be used by staff putting together training or development sessions for managers of researchers including PIs and doctoral supervisors. New resources include seven PIs talking on film about approaches to mentoring research staff and sharing their successes and tips. 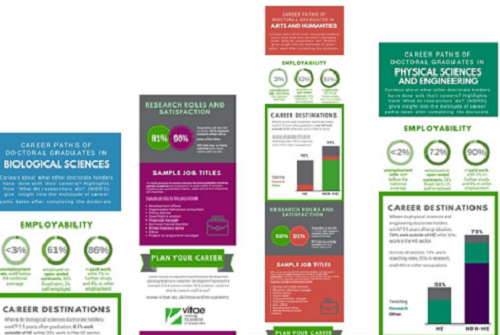 A short written guide to having successful career conversations is complemented by a set of discipline-specific infographics based on our popular publications series What do researchers do? Another new publication offers a series of checklists to help in supporting a researcher through a professional placement or internship, also useful for anyone involved in setting up a placements scheme. A new title in our researcher booklets series The researcher on placement is also being published to accompany this. Lastly, we have updated our guide for PIs to the UK Concordat to Support the Career Development of Researchers for 2015. All the resources are available to Vitae members when they log into our website. Vitae membership extends to all staff and students of a member organisation. The resources are suitable for individual browsing but could also be used as handouts or to enhance training materials or presentations. The new career conversations guide is also available as an editable file to allow you to include links to institutional resources. Explore a wider range of resources suitable for research directors and PIs via our orientation page supervising and managing researchers.